In recent years London Irish have signed World Cup winners, lads who have played in multiple Champions Cup finals and stars of Super Rugby, but if you fast forward a few years and look back we have a sneaking suspicion the most important addition to the club may prove to be a 34 year old veteran fly half who has travelled south from Northampton. We caught up with Stephen Myler to see how he has settled in, what he thinks of the season so far and what sort of relationships he is building up with his teammates. It seemed like Bedford were pretty tough opposition at the weekend, but we got the win. How did you find the game? Yeah, it’s a good win because I rate Bedford as a team. I know a few of their players and they’re a pretty good team who have given us a test both times we’ve played them this season. We would’ve liked the bonus point, it wasn’t to be but a win is a win and it’s another four points in the competition and a positive result in the end. That result sees us topping the group with 14 points and nicely placed for qualification to the next round. That’s obviously the aim, to make it out of the group and into the knockout stages. We’ve made a good start but there is still some rugby to be played so another big game this weekend and hopefully we can put in a performance that will get us the result and leave us in an even better place. How have you been finding the revised tackle rules in the cup? It’s an interesting one and it is having an effect on the game. From a tacklers point of view you need to be seen to be making an effort to tackle low and the difficulty for a player is that there are instances in the game where it is just impossible to make a low tackle but so far I think the officials have handled that well and there has been a bit of empathy toward certain situations that can’t be avoided. There’s definitely been a noticeable change to how the first person in enters the tackle which I guess is what they want to achieve with the trial law. Whether it’s sustainable who knows, but it’s been handled well in the three games we’ve had and I’ve no complaints. You started your career in Union when Saints were relegated but you’ve played a fair few seasons since. How have you found the standard this time round? It’s not a total drop off. There’s a massive amount of improvement left in us and I think we’re on a journey this season to achieving what we feel we’re capable of. I think we’ve shown it in a few small patches but not anywhere near as consistently as we feel we can. That’s a positive thing and playing against teams like Bedford and Pirates, Jersey or Ealing… There’s lots left in us and that’s an exciting thing. There’s quality players in this league and it was like that when I played in the league with Saints all those years ago. The difference between the Premiership and the Championship in my eyes is that on any day in the Prem any team can beat one of the other teams. I’m not so sure that’s the case in the Championship but there’s certainly a very high standard at the top end and some good players in the league. You’ve played in every game you’ve been fit for this season, but there has been a lot of change in the players around you. How do you deal with that? It doesn’t make it difficult for me to do my job… I’m kind of used to it to be honest. It does help having a consistent 9 and 10 because you work as a partnership and it helps the team to function better. I’ve always felt if you’re in those two positions, being so key to how the team functions, if you chop and change there you can’t get into a rhythm and develop those partnerships. That’s been the good thing for me this year, having that consistent game time I’ve felt quite comfortable when I’ve played. We’ve had a bit of rotation in other positions, new players coming in, but I’m experienced enough to know what I need to bring and to let those players express themselves and do what they’re good at. We’re in a good place, we’ve got strength in depth in a number of positions which is where we need to be. You talked there about the importance of the relationship between the players at 9 and 10. We’ve got quite varied skill-sets across our scrum halves, do you change your approach depending on who is playing in front of you? No I wouldn’t say the team, how we approach games doesn’t necessarily change… Like you said the good thing is we do have that variety in playing style, not just amongst our 9s but in our centres and wingers too. It’s just getting used to the different personnel. It took me a couple of games to get used to how Ben Meehan plays, I’ve played a fair bit with him now so I know his tendencies and how I can respond to that and let him do what he’s good at. Playing a bit more with Brendan and Scott in recent weeks has also helped me understand their game a little bit. It’s a good thing I guess that we have that variety. Different games call for us to use one of them as opposed to another. It’s my job to understand what they’re good at but essentially we are trying to work as a partnership and they’re all capable of doing that. You’ve had an impressive career in Premiership rugby, what lead you to join a club that had just been relegated? There were a number of things really. The time was right for me to leave Saints on a personal level. 12 years at that club was… obviously I’ve got very fond memories of my time there but it came to a point where I knew I needed a change to freshen things up. I’m in the twilight of my career and wanted a fresh challenge. I did consider going abroad, considered other options in England…. But I’ve had a couple of friends who have played at Irish, one of my best friends Joe Ansbro played here and speaks very highly of his time at the club. My mind was made up when I met with Les and Declan. What they thought of the challenge ahead of them and what I could bring to the squad in terms of my experience as well as playing. The idea is to get back up and then be sustainable when we get there and I saw my role being quite substantial in achieving that which was attractive to me. I’m not the kind of person who wants to coast through, play the odd game here & there and see out my career. I need to feel I’ve got a purpose and I felt I had that and that they were good blokes as well. They’re obviously very astute and have been around the game a long time… I just felt it was something to get my teeth into and it enabled me to stay in England which was a priority for me as well. It became clear at the Members Day before the start of the season that there’s a bit of a northern contingent at the club, Barney Maddison and Matt Rogerson joined alongside you and Fergus Mulchrone was here already. Is it good to have some people from the same background around? I wouldn’t say it was a northern clique or anything like that but… the north is a bit of a different way of life and it’s nice to reminisce and share familiar stories. One of the things that has impressed me most in my short time at Irish is almost all of the playing squad is very close knit and everyone gets on which is good. I’ve been in squads a while ago where that wasn’t the case. You get strong personalities in this industry and it can be difficult but we haven’t had that. From my point of view it is nice to hear those northern accents now and again but just good lads coming in and adding to the squad has helped us bed in. Even though I’m an experienced player it’s nice to be made welcome and to feel like you’re part of the team. As an experienced player do you feel it’s important to share your knowledge with the younger players at the club? It’s a strange one because in some aspects I still feel like a young kid who has only just started playing but on the other side I see myself having played a lot of games over a number of years and having gained a lot of experience and knowledge. I see it as the responsibility of a senior player to impart what knowledge you can and to help guys to develop as quickly as they can. The nature of the modern game as it is, you do need a strong squad and you need the young players coming in and pushing for a spot, firstly to keep the older players like me honest and playing well but also there will be a time they take over and if you can get them up to speed quickly it’s a good thing for them on a personal level but also good for the team which is ultimately what we want – the squad to be achieving things. If I can play a small part in that by helping them with whatever I can then obviously I will do. So is that something you see in your future when it finally comes to hanging up your boots? I’m not too sure to be honest. At the moment I’m not thinking about it… I guess I should be but as I said I still feel like a youngster who is keen and wants to play every week, play every minute of every game. I’m not of a mind-set where I can see the finish line and I’m just getting through. That’s not how I’m approaching it. People almost assume you might go into coaching post-rugby because of the position you play or your role in the team but at the moment I’m not too sure. I may need a little break! This is my 16th year playing first team rugby so I might take a short break but it may be something I look to get into. I’ve spoken to friends who’ve retired and they think they won’t want to be involved but then they really miss it and get back into things. I guess I’ll approach that when the time comes and see what’s what! 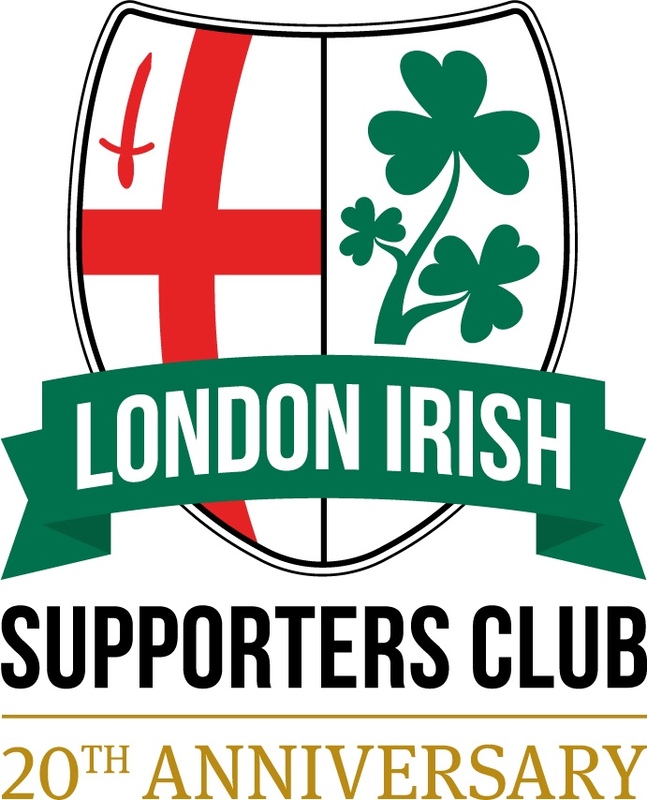 Speaking on my behalf and on behalf of all the fans at London Irish I hope that time doesn’t come for a while yet. Our thanks to Stephen for his time, to the club for their ongoing support and to @RugbyLI for interviewing the players.